Virgin coconut oil or VCO is a wonderfully versatile product. It has a host of nutritional and health benefits, including antifungal and antibacterial properties, and has even been reported to be helpful in weight loss and weight management. VCO is also a popular beauty agent, especially with regards to maintaining the skin’s natural moisture and keeping the hair strong and shiny. These, among many others, are just a few reasons why VCO itself or using VCO as an ingredient to food items or beauty products is a lucrative business venture. However, many such businesses fail because of one thing: they are not able to deliver high-quality products that customers have come to expect. Indeed, one of the most important things in this industry is to find a reliable supplier of high-quality virgin coconut oil. Once you’ve already established your business and acquired the necessary licenses, the next logical step is to find a partner that will be able to supply your raw material requirements on time and at the right price. You don’t have to look very far since the Philippines is one of the biggest producers of coconuts and leading exporters of coconut products like VCO in the world. Even so, there are still a lot of things that you need to consider in order to start a productive partnership. 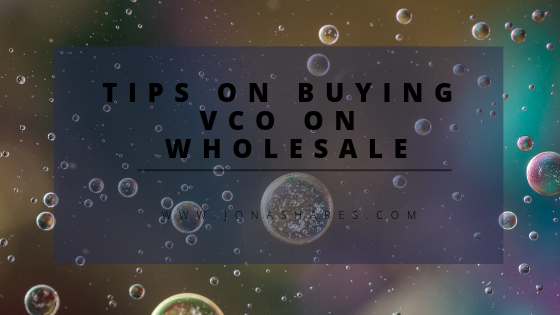 Here are some tips to help you in buying VCO in wholesale. Not all virgin coconut oils are made equal. That’s because there are two distinct methods used to make VCO, at least in the Philippines. One is called the dry or expeller method, where the VCO is extracted by flash-drying the coconut meat and then feeding the dried coconut meat into the expeller press. This process is easier and cheaper, but it produces VCO with a slightly lower quality because it involves heat. This causes some of the essential nutrients and enzymes of virgin coconut oil to break down. The other method is call the wet or centrifuge method, wherein the oil is not extracted from the coconut cream derived by pressing fresh coconut meat. Afterwards, the cream is allowed to sit for a while to let the oil separate naturally before it is placed into a high-speed centrifuge. The machine will ensure that all traces of the coconut cream is removed, leaving only the purest form of VCO. This is not to say that expeller-pressed VCO is not good or doesn’t have any benefits. Rather, if you want the best there is in the market then centrifuge-extracted VCO is the superior choice. It looks clearer, tastes and smells better, stays fresher for longer, and contains the complete array of nutrients that virgin coconut oil is known to have. Buying anything perishable on wholesale, including VCO, requires careful attention to supply and demand, as well as expiry dates and your capacity for proper storage. Centrifuge-extracted virgin coconut oil can stay fresh up to several years when stored the right way, but even so, it’s not good to keep a food-related product in a stockroom for such a long time. By knowing your business’s capacity to make, store, and sell your products, you will be able to better manage your inventory, budget, and acquisition and production cycles. Once you’ve determined the two above-mentioned factors, it’s now time to really begin the search for the virgin coconut oil supplier that will meet all of your needs. The easiest way to do this is to use search engines to get a list of reliable suppliers of high-quality VCO. From there, you can visit the websites of these manufacturers and determine if they’re the right fit for you. You can also join trade shows, sign up with organizations related to coconuts and coconut products, or even visit various B2B websites and forums where it is guaranteed that you can find fellow wholesale buyers, sellers, and traders. Remember that you may not be able to decide immediately after your initial search. It’s a good idea to make a shortlist of the companies that caught your attention and then conduct a more thorough research about these companies to help you decide. Some of the things that you should definitely look at are the following: their process and equipment, the location of their manufacturing plant (the closer to they are to coconut farms, the better), their certifications and licenses, as well as their environmental and other CSR programs. You can also ask if you can visit the manufacturing plant and maybe even talk to the owners or the top management to get to know them better. Once you’ve settled on your choice of a VCO supplier, all that is left to do is to place and pay for your order and wait for it to arrive. Of course, you should also do your part as a business partner. Make sure that you pay on time, in particular, and give credit where credit is due; you might even want to promote your VCO supplier to others who might also need their products and services. Good luck on your business venture!